I love a good Christmas story. I try to make sure we have a few new ones to read together during December and the elves always pop one in the Christmas Eve Box as well. We are huge Julia Donaldson fans in our house and only today were out hunting for the Gruffalo. “Stick Man lives in the family tree, with his Stick Lady Love and their Stick Children three.” -But it’s dangerous being a Stick Man. A dog wants to play with him, a swan builds her nest with him. He even ends up on a fire! Will he ever get back to the family tree? Perhaps Father Christmas can help? Julia Donaldson and Axel Scheffler’s most festive picture book is now an animated film by the Oscar-nominated creators of The Gruffalo, The Gruffalo’s Child and Room on the Broom films. This will be airing on BBC One this Christmas and we are so excited! Starring Martin Freeman as Stick Man, Hugh Bonneville as Santa, Jennifer Saunders as the narrator, Russell Tovey, Rob Brydon and Oscar nominee Sally Hawkins complete the all-star cast of Stick Man. What a line up! Since its publication in 2008, Stick Man has sold over one million copies and been published in over 17 languages. 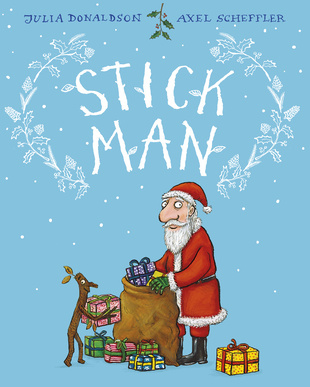 New gift editions have been created for children, parents and grandparents to celebrate Stick Man being the Christmas story of the year—including a gift hardback with reversible poster cover. This would make a super gift or just a wonderful festive family read. Be sure to tune in this Christmas to see the film air on BBC One. There is also a special book signing on 7th November which you can find out more about here. What is your favourite festive family read?